Despite the scars of the economic crisis, Corfu still merits its reputation as ‘the Garden Island’—a reputation that dates at least from Homer’s Odyssey. I wrote this book because I wanted to put a reminder of that on record. Today Corfu has a rich garden heritage, ranging from romantic old estates and colorful village gardens to stunning contemporary works by international designers. The book’s portraits of individual gardens, old and new, show how local design ideals have evolved over the centuries, influenced by global and mediterranean trends while still respecting the local spirit of place and drawing on local craftsmanship. Choosing which gardens to feature in the book was difficult. Many more gardens, equally beautiful, exist across the island and could have been included in the book, but for the page limits on its size. big terracotta urns like those that were once used for storing and exporting olive oil. Corfu gardeners also make quite distinctive plant choices: olive, citrus, and, in the last thirty years, native pencil cypress trees, are favorites, as are wisteria, jasmine, and orange trumpet vine. People also noticeably choose plants for their scent. And a tradition that Corfu shares with the rest of Greece is the avlí—the courtyard garden close to the house—in which people grow both flowers and fruit. Looking beyond Corfu and beyond Greece, I believe that, as a group, Corfu’s contemporary gardens are significant from a design standpoint. In our era of globalization not just the owners but also the designers of these gardens come from a wide range of countries in Europe and beyond. 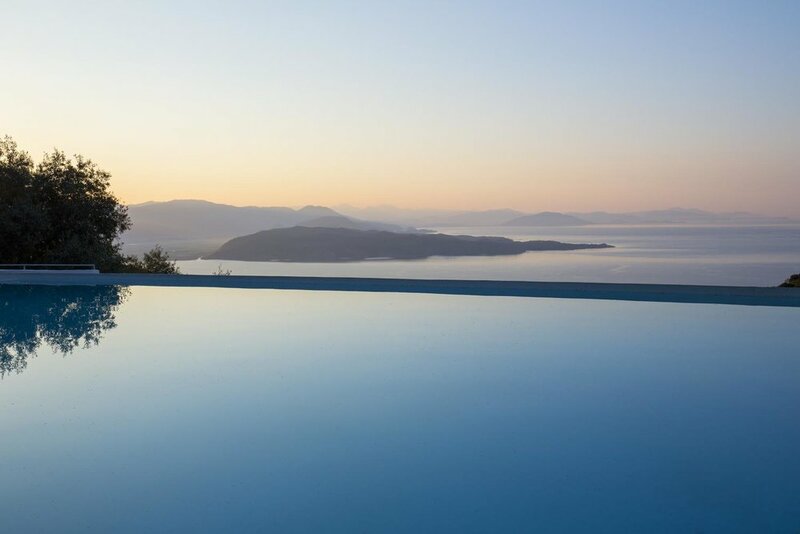 They have found that Corfu’s natural beauty makes it an ideal place to practice the naturalistic approach to design that’s been spreading across the world’s mediterranean climate zones. Designers using this approach take their cues from the wild landscape, using site-generated designs that allow the ‘spirit of place’ to speak for itself, and using local native plants for their general toughness and low water needs. Our book concludes with a chapter on the wild landscapes—both because these have inspired the island’s new gardens and because they are so crucial to Corfu’s identity. I hope that perhaps the photos in the book will encourage more visitors to come to Corfu to see its natural beauty for themselves, and that they may also remind people who live here of how much there is to be proud of and to respect in the island’s natural heritage. When Corfu is referred to as a garden island, it is in the traditional sense of the term, which includes notions of abundant green. Compared to other Greek islands, this one could even be considered lush. Those of us who battle every day with the rocky infertile soil and the summer drought find it amusing that we’re accused of having it easy. Most of the summer green of the landscape comes from the shrubs of the maquis, the lentisks and myrtles and holm oaks, all typical mediterranean plants that maintain their greenness during the dry season because of the abundance of winter rain. Many of the gardens in this book have used these plants and others like them, along with the natural rocks (both in situ and used to build dry walls and cobbled pathways) as building blocks in their composition. They form the canvas on which the cultivated ornamentals, the flowers, the shrubs and the trees, are embroidered. When leafing through the pages of this book you will notice how seamlessly the gardens fit into the landscape, whether it is a distant background or an intimate embrace. If I were to point out an outstanding common element in all the gardens sensitively and understandingly presented in this book by Rachel Weaving, it would be their inclusion in the landscape. They are all gardens with views, stunning views, both distant and close. None of them would be this exceptional in any other setting. Each garden is adapted to its surroundings in different ways, though many, if not most, of the plants are the same ones. And though practically all include, besides the shrubs of the maquis, the standardbearers of the Corfiot landscape, the olive and the cypress, not to mention the local live oak and the Judas tree, there is no sense of repetition or monotony. The landscape aids the designer, whether professional or amateur, in creating something unique. All of this is captured in the atmospheric photographs of Marianne Majerus, which add elements of mystery and poetic depth, and bring out details invisible to the casual lens. She has captured the spiritus locii, transporting us from the island of our everyday lives to the Corfu of our dreams.